So close… and yet… so far. For the first time this week, I didn’t finish the essay I started today. Well, let’s back up a sec. If you were to look at what I wrote today, you’d certainly think it could be a finished essay—it’s certainly effing long enough to be—and to some extent, it is. 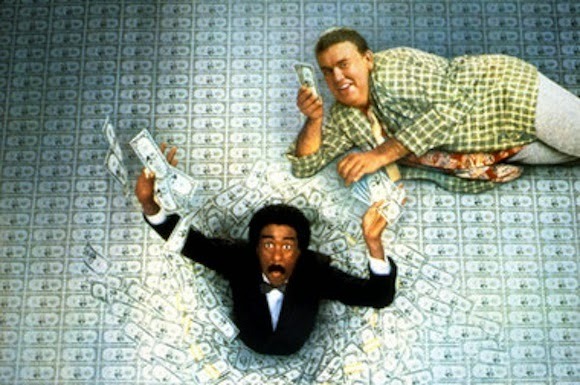 The initial plan for today was just to write the essay about Pryor’s decline in the ‘80s, specifically by comparing Blue Collar, a ‘70s movie about poor people, to The Toy, Superman III, and Brewster’s Millions, ‘80s movies about rich people (made when, ya know, Pryor had become a very rich man). Then we did the big reshuffle yesterday, and determined that the last essay was getting the boot… which means that the “oh by the way, end of the book time!” stuff that would end it would now go on the end of this one (where, as I mentioned, it’s a bit more of a natural fit). So, yeah, I didn’t write that stuff just yet. I made it right up to it, and then my time had run out, and my computer’s battery had run out, and the jerkwad security guard for the one nice reading room at the NYPL who makes everyone unplug their power cords (even though all the other guards let you and you can charge them in several other rooms in the building, we had words today, don’t get me started) was there, so I figured to hell with it, I’m at a stopping point, let’s go home. So I did. Which means that tomorrow is a little bit of a change-up, a day when I’ll try to pick something up and finish it rather than work all the way through. And I’ll also spend quite a bit of time reworking the stuff I wrote today, which I usually take at least one pass at, at the end of the day, but didn’t, for reasons previously explained. Anyway, I’m somewhat OCD and being this close to finished without being finished is KIND OF MAKING ME INSANE, but we’ll deal with it. We will! And tomorrow, y’know, hopefully, first draft.